Please join us on February 29th for a Creative Jam, an inspiring two-part design experience that demonstrates and celebrates creativity. The Adobe Creative Cloud team will host the Creative Jam presentations. This one-hour design showcase highlights the work of 3 local creative leaders. At the same time, in the next room, Designers will be competing in the Creative Jam tournament, a 3-hour design charrette showdown. 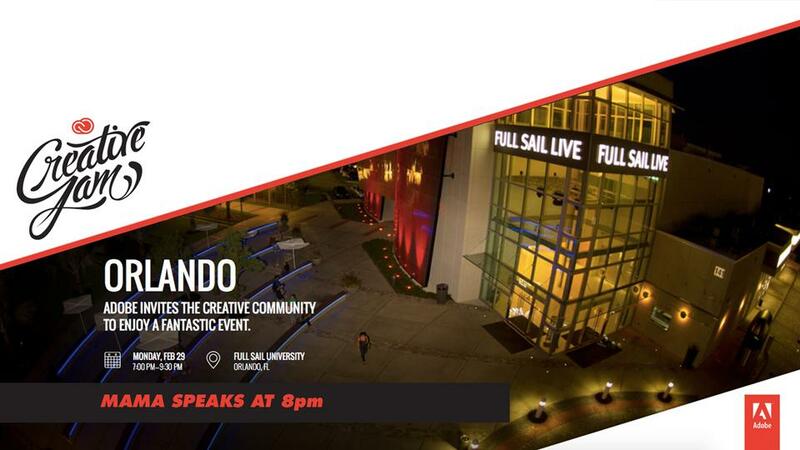 This event will have two categories: Visual Design and Motion Design. Once the Creative Jam presentations wrap, tournament participants will take the stage to share their creations with you. As part of the audience, you'll vote on each submission and select the People's Choice winner. There will also be Grand Prize winners decided by a group of Judges! Doors open at the Entertainment Business Auditorium. Settle in, and meet your fellow creative community. The tournament will be in full swing—pop your head in and see how it's developing. Creative Jam Talks begin. Sit back as 3 local creative leaders walk you through their personal creative process. Creative Jam tournament competitors share their solutions, inspired by a theme announced just hours before. Audience and Judge voting. Awards follow. Everyone socializes and gets to meet the teams.